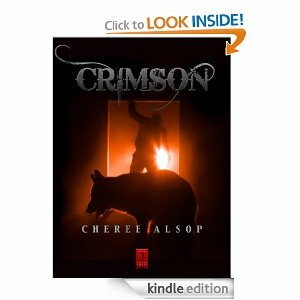 Crimson, the third book of the Silver Series, is about a teenage boy who dies in a car accident and awakens a werewolf. Burdened with heavy guilt over his sister’s death in the same accident, Kaynan escapes with a blind girl named Grace who gives him purpose and direction. They seek shelter with a pack of werewolves who brave dangerous odds to help them. Kaynan is given the ultimate chance to make up for his poor decisions, but dying again might be the only way to redeem himself. Crimson is a story of love and redemption amid danger and violence, a story where acceptance of change may be the only way to survive. In Crimson we meet some new werewolfs and they have a bond and take care of each other. We still see Jaze, Jet, Mouse, Nikki and the other from book 1 and 2. Ms. Alsop does a great job of developing those characters as well through out the story. I really enjoy that Kaynan and Grace have choices to make and issues to deal with. I stayed up passed one in the morning as this story consumed me and I knew I would not be able to sleep without knowing what happened. One of my favorite parts is the hair coloring session. It just cracked me up. This story does contain violence (but it is tastefully written and I did not have any nightmares) It has nothing more than a few kisses. I did think some of the fight scenes were a bit much (as in I did not think it was realistic) and it amazed me how the SUV they drove was in several accidents and never needed to be repaired. But other than that the story was awesome. I totally recommend this series that is unique and keeps you wanting more! you can pick up any format here on smashwords!